This past Saturday was the one year anniversary of the purchase of our house. Now if you’ll remember, we didn’t actually move into the house until two months later because I wanted to remove all of the carpet and refinish the hardwood floors first. We also needed some pretty major plumbing done. So we didn’t move in until October 19th. But we closed on August 16th, and I started working on it right away. So it’s time for a one-year tour! Since I’m sharing not only the past and present, but also the future plans for each room, I’m going to break this up into more than one post. One post with all of that info about every single room of our house, including the exterior, would take way too long to read. So today I’m going to show you the living room, entryway, music room, hallway, and hallway bathroom. So let’s start the tour, shall we? And the only thing that has changed in the entryway is that I finally added the trim around the front door. As you can see, there’s still so much to be done. 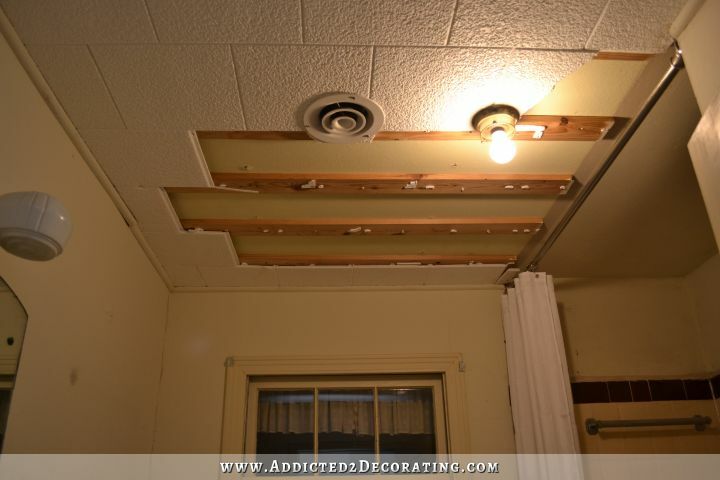 First of all, I want to remove all of the polystyrene tiles from the ceiling, as well as the 1 x 4’s that they’re attached to, and I want to re-drywall the ceiling. That will be a huge undertaking, so it’s something I’m going to hire out. But mine will be wider. I like an overmantel to be the same width as the fireplace. 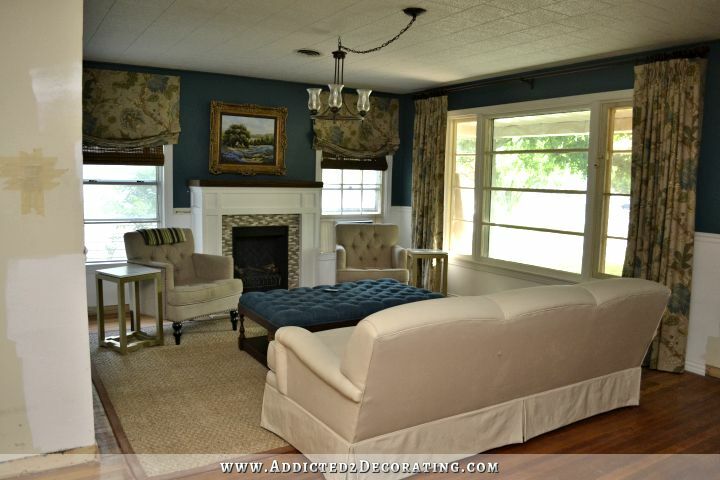 But it’ll be very similar to that one, painted white to match the fireplace. I had originally thought that I wanted grasscloth wallpaper in the living room and entryway, but I think I’ve changed my mind. 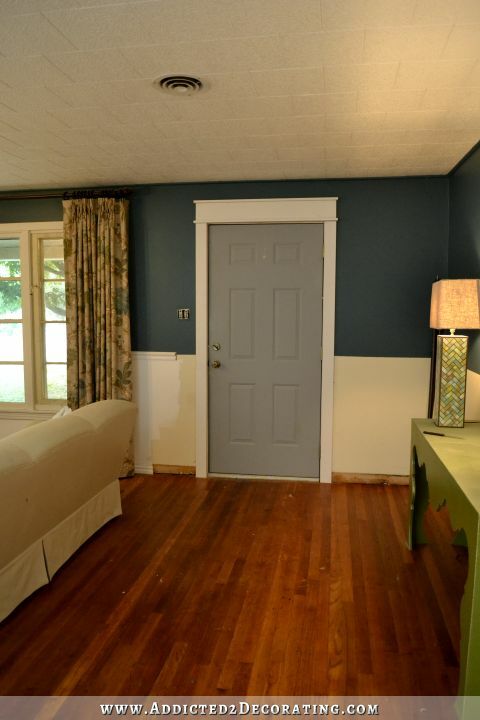 I’m perfectly happy with the teal wall color that is on the walls now (Mythic Forest by Behr), so I think I want to save the grasscloth wallpaper for the music room…but not teal. I would use something more neutral instead. 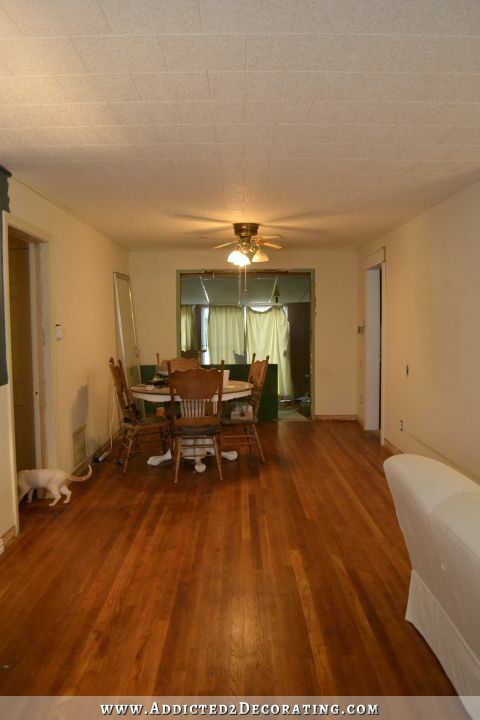 In my mind, it would be a nice transition between the living room/entryway and the kitchen. I removed the carpet and refinished the hardwood floor. My father-in-law removed the sliding glass door when he was here in February, but you can see part of it is still sitting over to the side. Yep…it’s been sitting there since February. I need to trim that door out, and it shouldn’t take that long to finish. But the reason I haven’t done that yet is because I first needed to figure out if the doorway needed to be moved and/or widened. At the beginning of the kitchen remodel, I kept going back and forth between wanting to bump out the kitchen wall to expand the kitchen, but obviously I settled on not doing that and keeping with the original kitchen footprint. And then I was unsure about how I would arrange the music room, so I wasn’t sure if the doorway might still need to be moved over and/or expanded in any way. 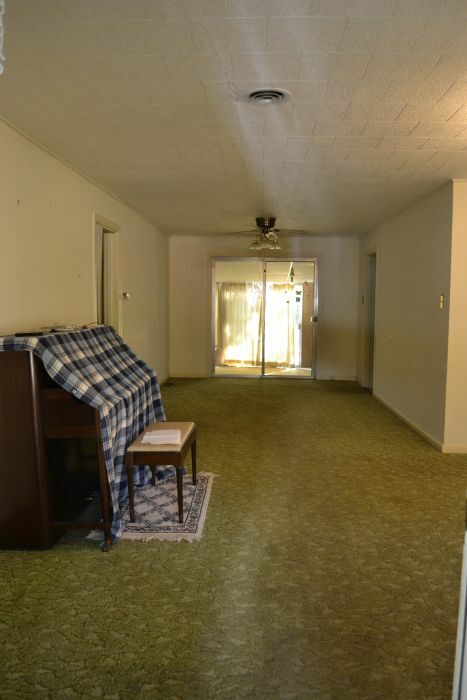 But now I think I’ve decided to keep it just like it is, and repeat that same doorway opening between the entryway and the music room. That will give some definition between the entryway/living room and the music room without it feeling too closed off. It will also allow me to decorate those spaces independently from each other (i.e., teal walls and wainscoting in the living room and entry, and grasscloth walls in the music room). Right now, it’s just all one big expanse of space, and it’s just too much. It would force me to treat all of those areas as one when it comes to wall color/treatments, and that’s not what I want at all. So basically right where the music room wall ends on the left on the picture below, there will be a wall built there that is parallel to the wall where the front door is, and the doorway will be exactly the same as the one where we removed the sliding glass door (that I have my back to while taking this picture below). The most important thing that will go into the music room is a piano. I don’t have a picture, and it’s currently in storage, but it’s the piano that my mom learned to play on when she was a young girl, and then I learned to play on when I was growing up. It’s nothing fancy — just a very simple upright piano. But I love the history behind it, and can’t wait to get it in my house and decorate this little music room around it! As a side note, I’ve mentioned before the difference in color between the old wood floors in my house and the new red oak in the kitchen. You can really see it here. It’s a huge difference, which is why I’m going to be staining the kitchen floor to get it to match a bit better. It’s so crowded looking because there was originally a closet right there on the left just as you entered the hallway. That closet wasn’t original to the house, and wasn’t really framed out and trimmed out properly, so I removed it. Here’s a view of it from the other direction, with me standing in the master bedroom doorway to take the picture. The door to the right of the closet is my office. Today, the hallway doesn’t look a whole lot better, but again, at least the green carpet is gone and the closet is gone. 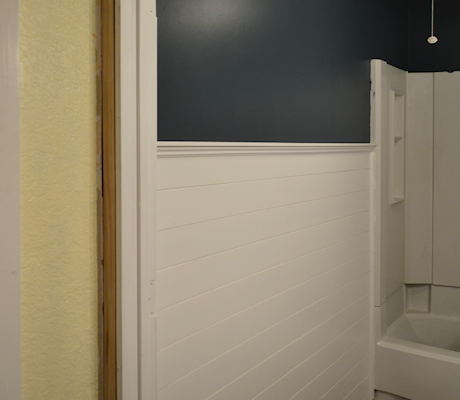 And of course, I tested out some different colors/stains on the doors a while back, so those still look the same. I’ve decided to go with white trim and black doors, so hopefully I can get this mess all looking pretty and cohesive before too long. One other thing that has been done in the hallway is I removed the polystyrene tiles from the ceiling, as well as the 1 x 4’s that they were attached to. That caused the old, thin drywall to crumble in areas, so I ended up just taking all of the drywall off of the ceiling, and my brother-in-law and sister and I put up new drywall in there at the same time we did the drywall on the kitchen ceiling. So the ceiling and walls still look like a mess, and are in need of some taping and mudding before they can be painted. And then here’s the view the other direction back towards the living room. 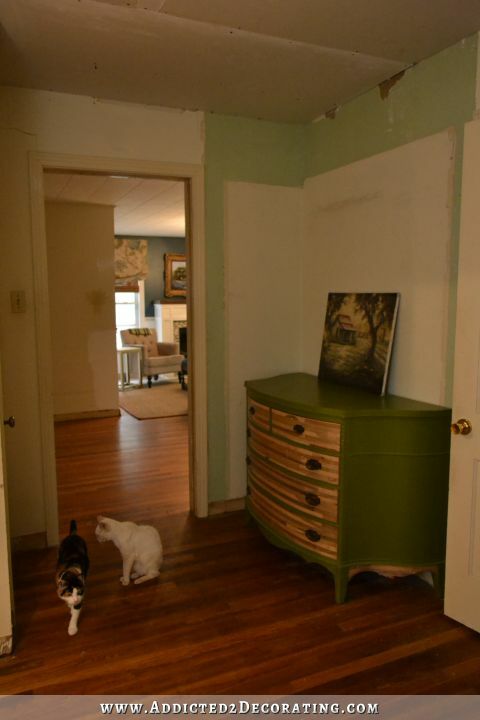 You can see where the closet was removed, and at one time the walls (along with everything else in this house, including the exterior siding) was painted seafoam green. I do still have the original closet on the other side, but it’s filled up with a big metal thing that is part of the furnace, so it’s not really usable as a coat closet. And I suspect that once we get our HVAC system, that closet will be used for the part of the system that goes inside (don’t know the name), so I really don’t have a usable coat closet. That’s something I hope to remedy, but I’m not sure where I’ll put one just yet. 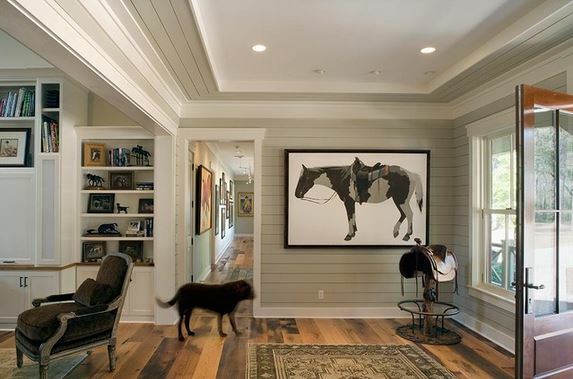 As of right now, the plan for this hallway is to cover the walls with wood slats to mimic the original shiplap siding currently in the breakfast room. I keep coming back to this picture as inspiration. 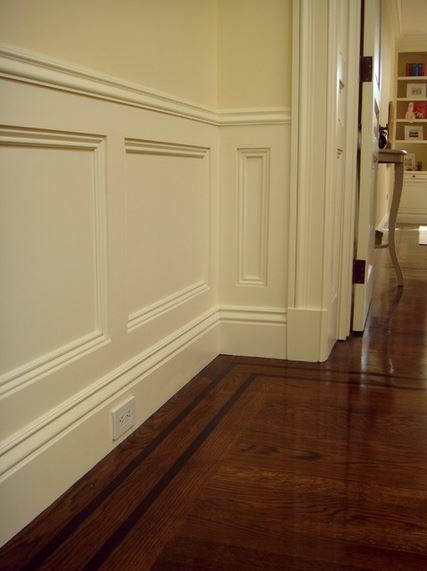 I thought for a long time that I wanted the walls white in the hallway, but now I’m thinking I want a light neutral color so that my pretty trim around the doors will stand out more. 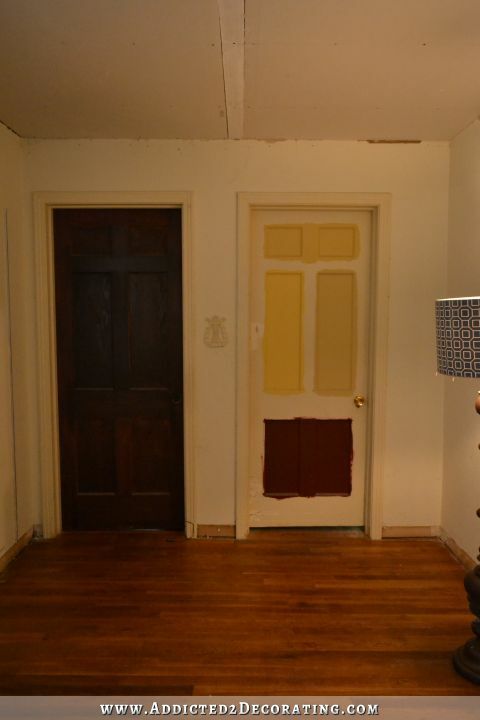 And of course, the trim around the doors will be exactly like the new trim I’ve put around the kitchen doors and the front door, and I want my doors painted black. I’d also like to add a solar tube to the hallway so that it can get some natural light. Right now if any of the bedroom doors are closed, the hallway is so dark during the day. It looks very much the same today. I did remove the shelves from around the toilet, and also the metal towel holder beside the tub. I also started taking down some of the polystyrene tiles from the ceiling, but didn’t get very far on that. The good news is that I think I’ll actually be able to salvage the drywall on the ceiling. Of course, I’m pretty sure that everything else in here will need to be ripped out down to the studs, so I should probably just re-drywall the ceiling also. 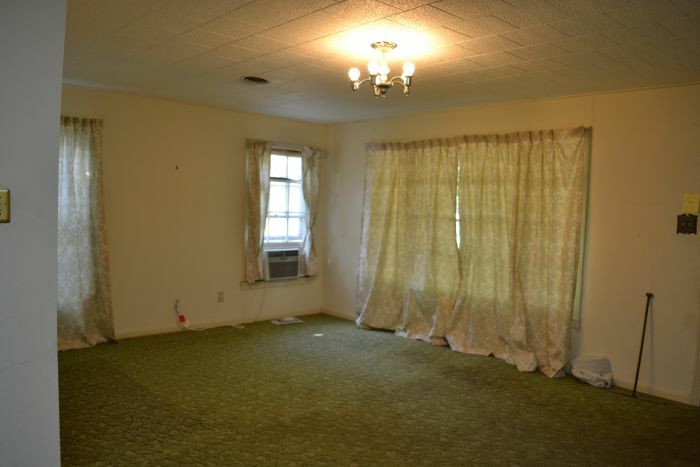 That window will be removed since it looks out into the sunroom (which will eventually be the family room), so I think I want to add a solar tube to this room for some natural light. I had thought at one time about doing some temporary stuff in here, like painting the tiles white, and giving the walls a coat of paint. But I’ve decided against that. I’d rather not waste my time and money on temporary fixes like that when there’s so much to do in this house, and temporary fixes are not the end goal. So I’ll just live with the bathroom like this for now until I can get to the real remodel (which I’m hoping will be next year!). And as far as how I want to design and decorate this room, I’m not completely sure yet. 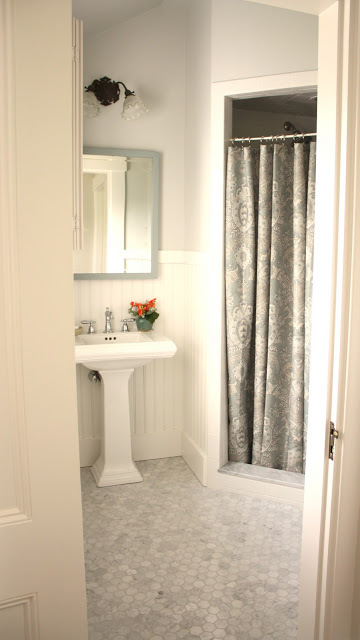 I keep bouncing some ideas around in my head, but I find myself constantly going back to this guest bathroom from For The Love Of A House. 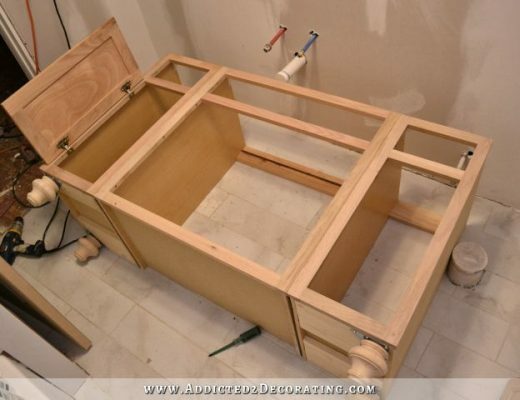 By the time I actually get to my bathroom remodel, I may have completely different ideas about what I want. 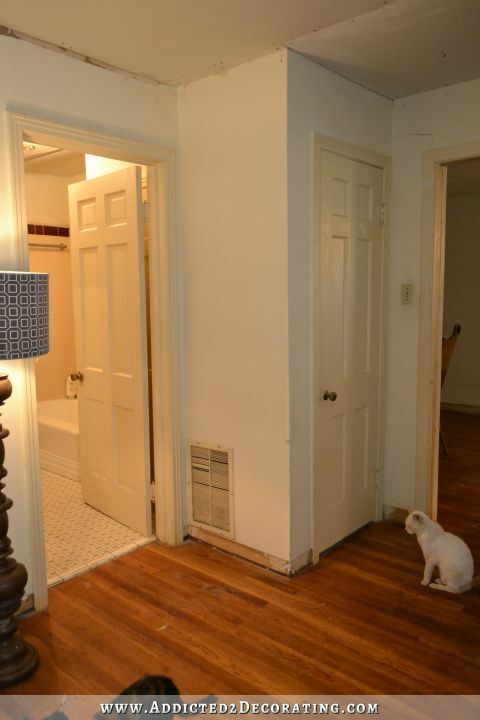 But I do love the pedestal sink (which is about all my little bathroom can hold), the marble tile floor, and the wainscoting. It’s simple and pretty, and at least right now that’s what I think I want for this bathroom. i hope you add a lot of lighting in the hallway. with the black doors and no windows it is going to be dark. in our hallway 5 door that are dark wood and one light in the hallway (it is really dark) and we have a outlet that have a night light just to add more light. Oh, you’ve come SO far not even considering the kitchen redo. And you are making this into a top notch home. Love your work. I’m so very happy you are saving this old home. It deserves being saved. So proud of you. Congrats on your progress, Kristi! You have come so far and I love all your great ideas for finishing your home! I also love cozy, intimate spaces. I really enjoy watching your progress! OK this us why following your blog is just so much fun. There will be many more projects to enjoy vicariously and get good ideas from. I have to say Amen to your sentiments on the ever popular, and in my opinion, far too exalted “open” floor plan! I don’t get it. 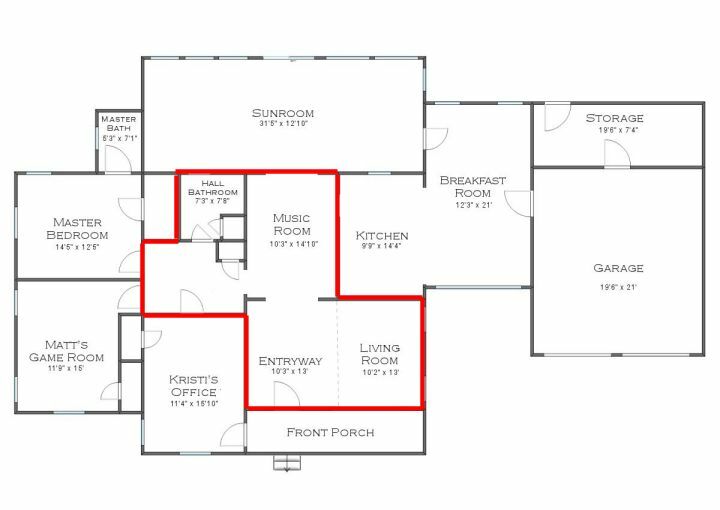 I live in one and while these floor plans look nice they are entirely too noisy! 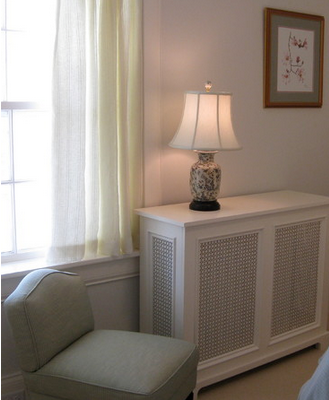 Plus you have be cognizant of keeping all your designs super cohesive so that each room flows from one to the other. 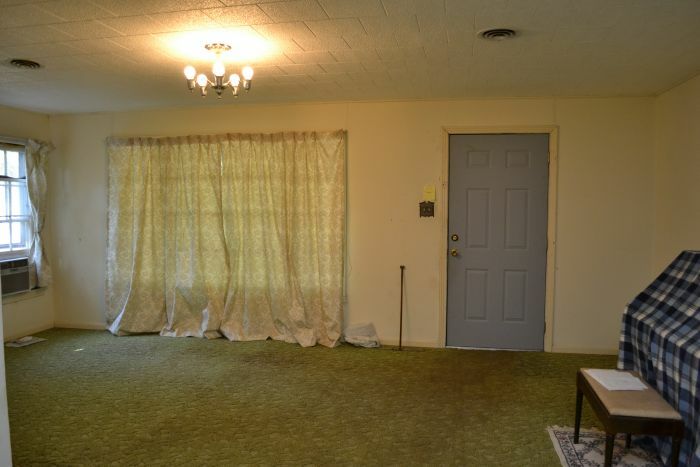 Anyway, note to self – next house to have actual rooms with walls. Lovely to see your progress, and can’t wait for the upcoming year of projects. Hope you don’t get sick of us lurking over your shoulder. Wish I lived close to you so I could be your apprentice. Kristi, what you have done thus far is gorgeous. Your work is so perfect and I love your floors you refinished, they look amazing. Take care and don’t forget to get some rest along the way. I’m still amazed at what you do every single day! 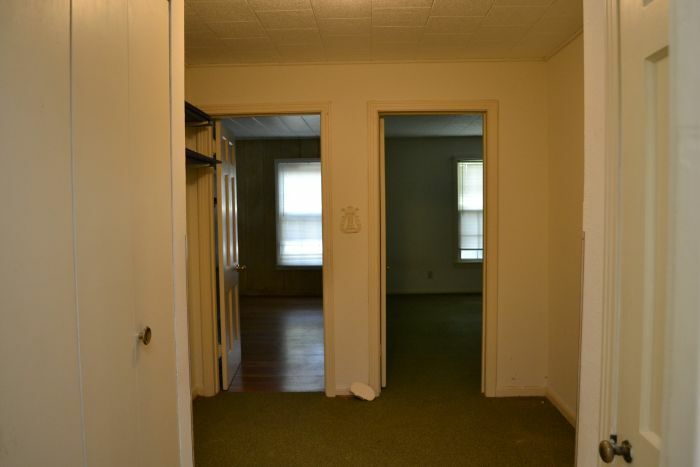 Why on earth would anyone put studs up and add those ceiling tiles to the whole house? You gotta wonder, what were they thinking????? You’re going to make it beautiful!! Tremendous accomplishments, Kristi! Kudos to you! 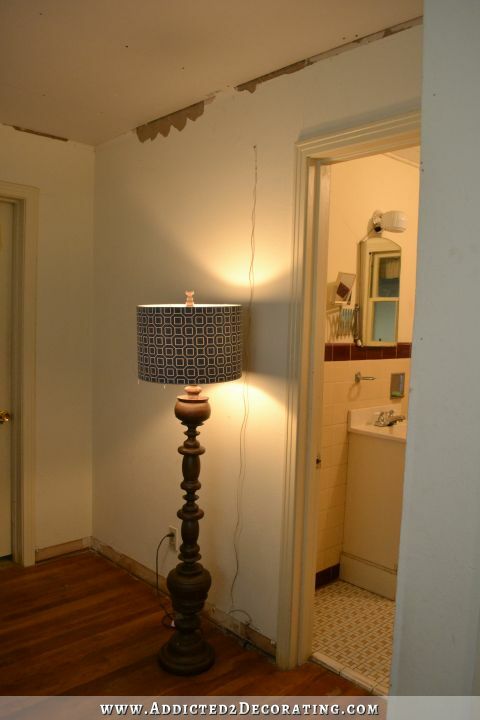 Now about that bathroom…you? Neutrals? cough…cough..lol! Don’t get me wrong, I totally love it with the marble floor, white & gray tones, but I am the colorphobe! Teasing, Kristi, teasing! Thanks so much for the house tour, Kristi! You’ve accomplished sooooo much in one short year. The floors are just gorgeous and add so much to the loveliness of your home. Looking at the living room and remembering all the projects you finished in there once again makes me shake my head in amazement. I really LOVE the new door trim around the front door. It’s just so elegant, and puts your home into another class altogether. With the soon-to-be completed kitchen, you’ve not only added beauty and function to your home, you’ve increased its market value too, so everything you’ve done is worth $$$$$ in your pocket while contributing to yours and Matt’s enjoyment. I am so looking forward to the next year’s projects. You’re the only blogger I subscribe to. Why would I need anything else? I am with you on open layouts. I do not like them either. You have done a great job in the last year. What is funny is how you have affected my house in the last year. 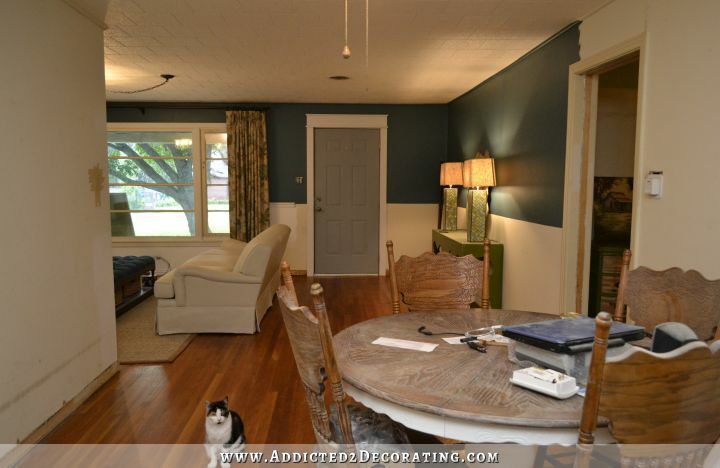 I have refinished all my wood floors, made a built in book shelf with cabinets similar to the condo, painted a desk, fabric covered some lampshades, experimented with making drapes (failed) and painted walls. I am now preparing to tear down a wall. Learning it all from you. You have made progress in your home and have encouraged me more than you know to make progress in mine. Thanks and happy housiversary. Congratulations on all of progress in your first year. Since I bought my little house one 4823 years ago, I did one major project a year while working for full-time. Because I lack your talent, I had to hire most everything from the get-go. Taking pictures of the before and after and keeping a scrapbook or Photo Album is the best advice I can give any new homeowner. When I had my roof replaced, I had a solar tube placed in a dark hallway upstairs. Unfortunately I could not use the largest one because of the distance between my rafters. So I had to settle for the smaller one. 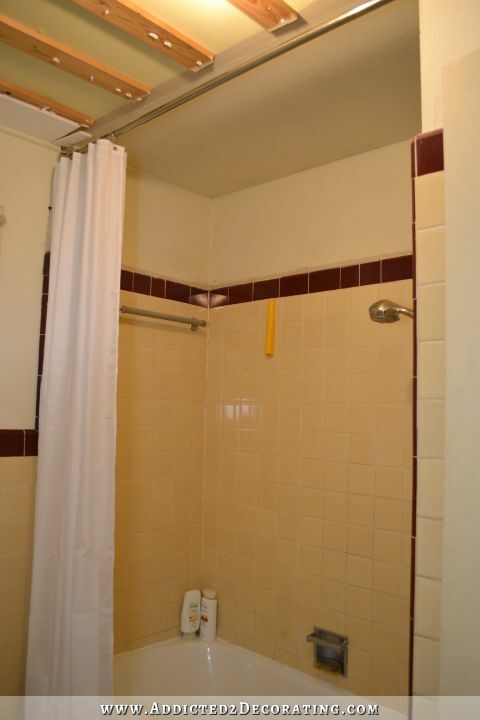 I do regret not putting one over my tub, because there is no light in there and I have an old-fashioned arch that would just require too much demolition to remove/install electric. 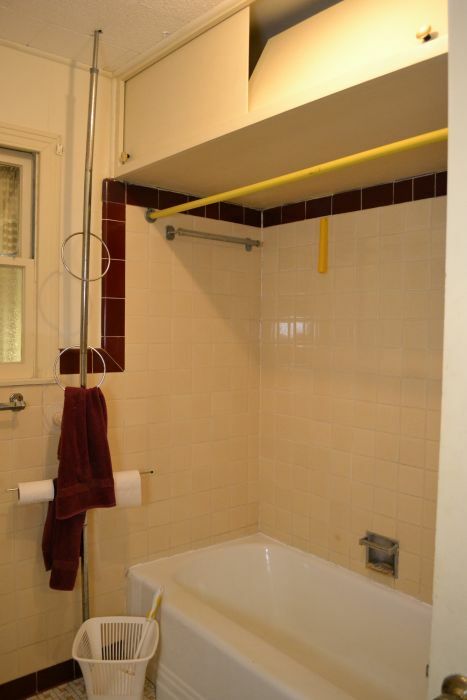 So your idea of the tubes in the hallway and the bathroom are terrific; I hope you can get the largest ones they make. Looking forward to tomorrow’s post. Actually that comment should be: my house was built in 48, and I bought it 23 years ago. I also forgot to mention that instead of ripping out a perfectly good cast-iron tub I simply had it reglazed. Since your husband is in a wheelchair I don’t know if you plan to do a roll-in type shower. What a major undertaking! Kudos to you for all the work. It will be soooo very nice when it is completed. Wonderful job on the living room…even if is not finished to the level you want. It is an amazing transformation. Do you hire your self out?? Moving back to TX next month and looking for a house ….not much on the market that is acceptable …and what is, is gone over night….may have to do a remodel on one; stay tuned. It’s so fun to see the progress you are making! Even the rooms with only small changes (like the bathroom) look better already! 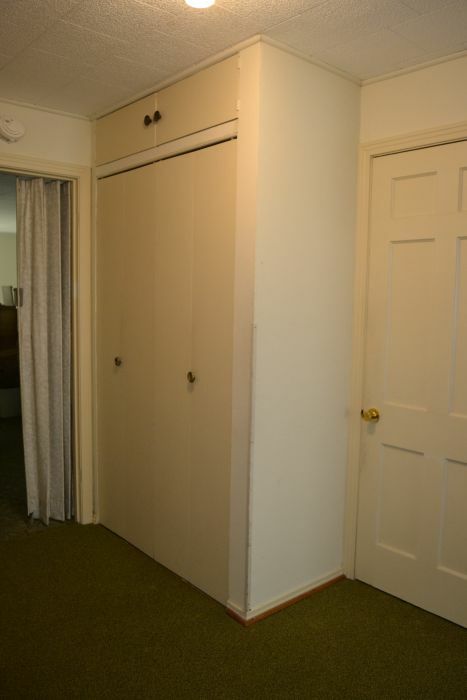 What about putting a coat closet in the corner created when you partially wall off the music room? So straight ahead on the left from the front door? Like everyone else here, I have been admiring your work, your work ethic, your ideas, your creativity, your stamina…and everything else I haven’t mentioned. Another thing I appreciate is your photos. Too many bloggers put 27 photos of the same thing from different viewpoints when 2 would do. And you help those of us with less-than-perfect memories by recapping projects. “Oh yeah! I remember that!” Thanks for being such a dedicated teacher. 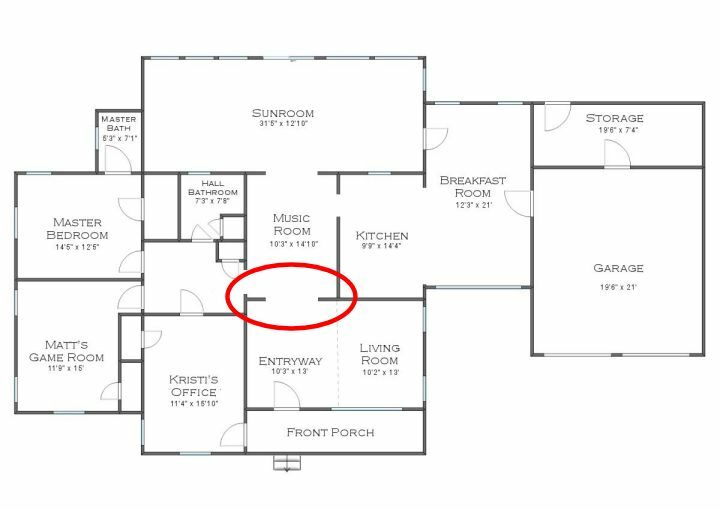 I have been reading for a very long time (almost 4 years) and just now noticed the very tiny bathroom that you have off your master bedroom. I’m really excited to hear what your plans are for it. 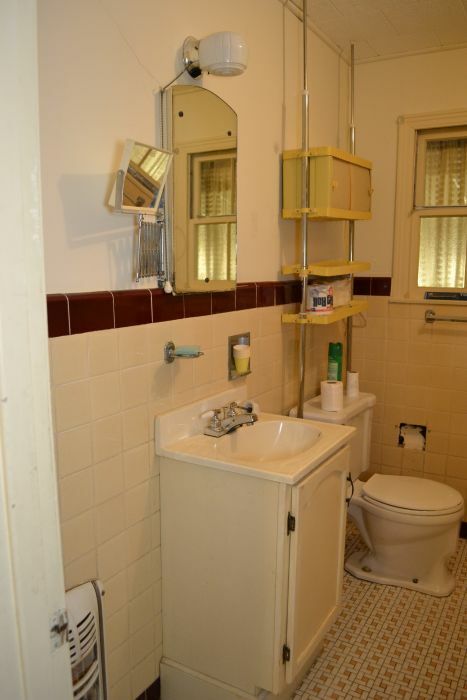 We also have an impossibly small Master Bath in our 1961 fixer upper and it’s going to be our next project we tackle. You’ve accomplished soooooo much! 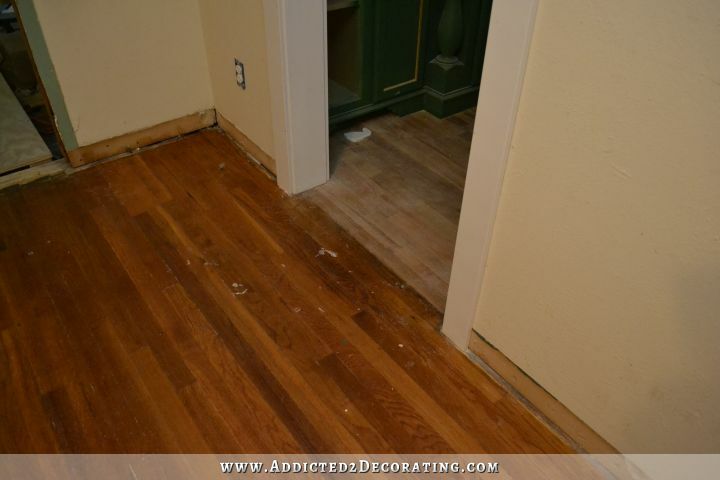 Its looking great and every step you take in these rooms is another step in getting phase I complete and then on to another area of the home. I’m dazed and amazed! Keep up the good work but remember to take time for yourself and rest. Oops! Forgot to address you ‘want’ of a solar tube light in your hallway. We have one in our bathroom and LOVE IT! Its located off our dark hallway and gives off light to the bathroom and the hallway during the day. On ‘full moon’ nights we even get light in our bathroom. I’m sure you will be glad you invested in one when you get to that point! When we remodeled we wanted french doors but didnt want to take up space in the rolm when they were open so we put in pocket doors. They are beautiful, its just a thought for your music room! I love you photo-bombing kitties!! Thanks so much for giving us a tour of your home…it helps to put your projects in perspective. I agree with you about the open concept thing. I have lived in a house like that, and I must say, I love my little 1960’s ranch with independent rooms! I look forward to seeing your completed kitchen and all the other things you want to do…you inspire all of us! Wow! You have done so much work. And your ability to see just how beautiful this house can be is to be applauded because when I see the befores I’m not sure I could take on this house. The value added even at this point is tremendous. Just wait until you are finished! I wish you the best! You have great taste and are a true inspiration! P.S. I can’t wait to see your sunroom – I know it will look amazing! 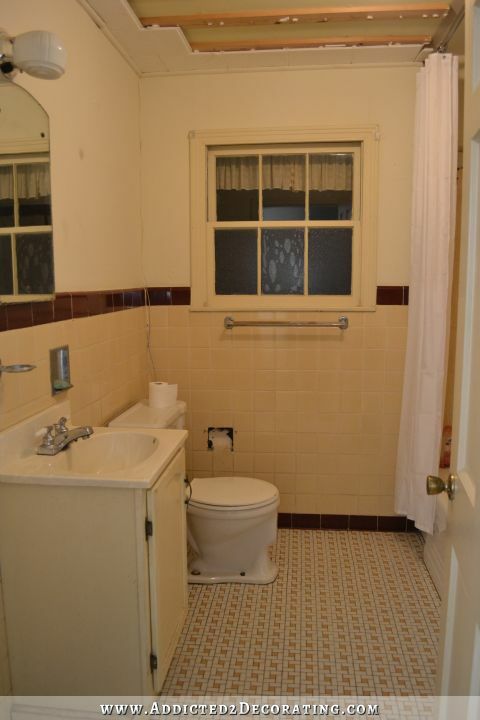 If you get rid of that window, what about the second exit in the bathroom? Is there room where you might could do pocket french doors? How elegant would that be to enter into a quaint little music room, with a touch of sparkle before hand. My Grandparents had a home, built in the 20’s, that had french doors leading into the dining room. It wasn’t even a fancy 1920’s house, so the idea that it might be too fancy shouldn’t be an issue. Unless you just don’t have the room to make them pocketed? But out of the way, and still pretty too when you want them closed, would be fab! Everything you’ve done thus far, looks amazing, you & Matt, must be very proud of what you have accomplished, especially when you compare it to the before photos….great job lady!!!! I read through the comments quickly to make sure I wasn’t duplicating one and wasting your time, so please forgive me if I missed one discussing your front closet dilemma. Interesting! I’ve only ever seen them in closets, so I had no idea that was even an option. Thanks for the info! It would be great if I could get that little closet back and actually make it usable.